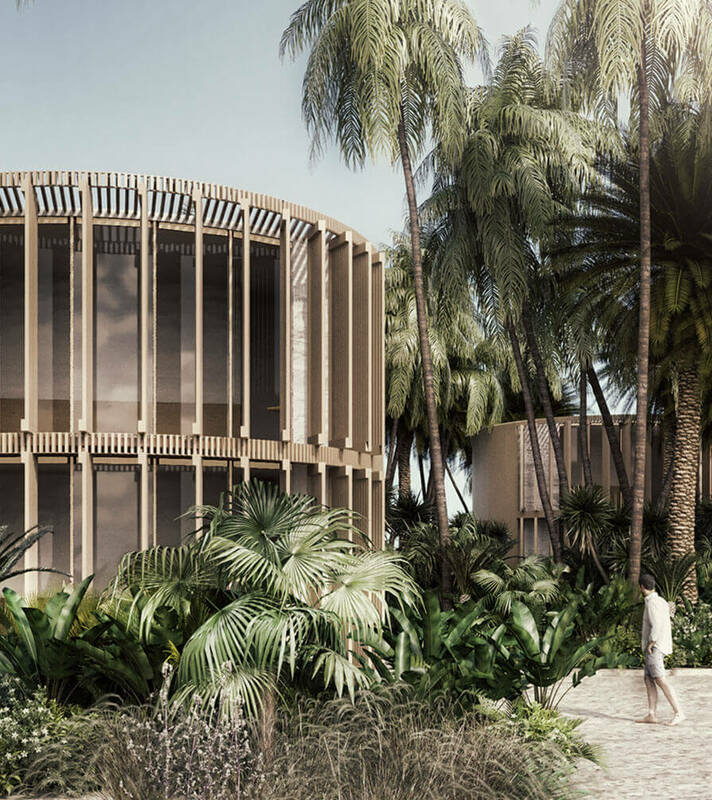 Inspired by the vernacular architecture of south-eastern Mexico, as well as the geometries of the immediate context, Hotel Tulum is designed with the aim of providing an exclusive tourism experience in constant connection with the extraordinary natural surroundings of the Riviera Maya. 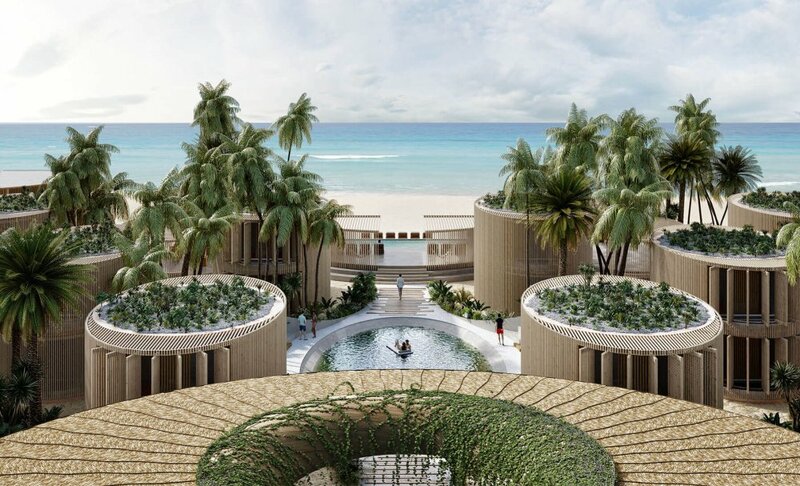 This is a project based on the idea of a villa and luxury amenities, which dialogue openly with their beautiful surroundings: the crystalline waters of the Caribbean, the lush tropical vegetation and the white sands of Tulum, making it an ideal site for dialogue between architecture and context. 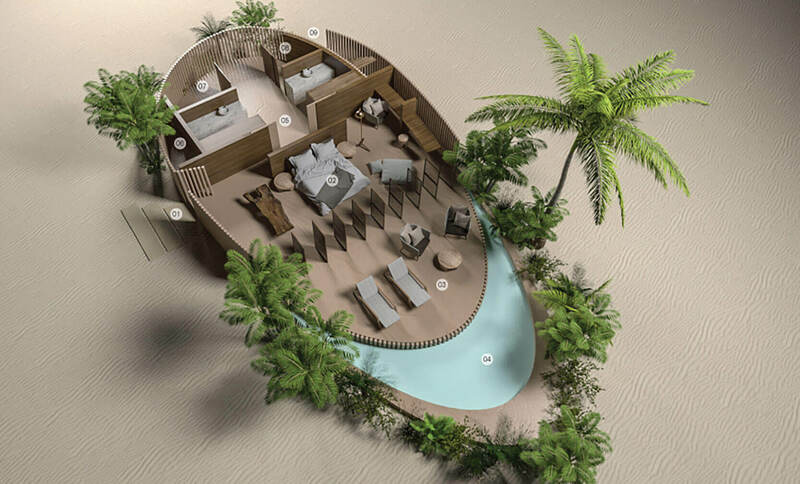 The concept and distribution of the project was based on the study and reinterpretation of the classic Mayan house, with its elliptical floor plan. The elliptical geometry of each element, together with the positioning of the volumes within a sinuous outline permits visual fluidity between the interior and exterior spaces, without ignoring guests’ privacy. 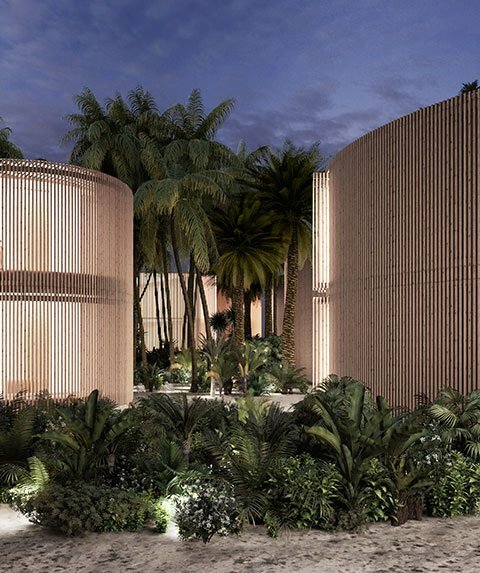 Each villa-unit occupies an elliptical architectural plan, with the habitable spaces located in the center with the extremes containing transitional spaces (balconies and plunge pools), producing a sense of permeability and continual connection with the exterior. The external enclosure of each unit is wood, with a series of vertical screens that can be freely configured according to the weather and preferences of the user. These lightweight structures, which take advantage of natural light and allow guests to enjoy the climatic conditions of the site, express a versatile volumetric presence that changes throughout the day, shifting from being architectural bodies to become luminous elements at night, while forming part of the landscape at the same time. The start of the visual and spatial tour is marked by the lobby, housed in a large circular volume. From this distribution hub, two natural water bodies are laid out in a straight line, extending visitors’ first visual contact with the sea. 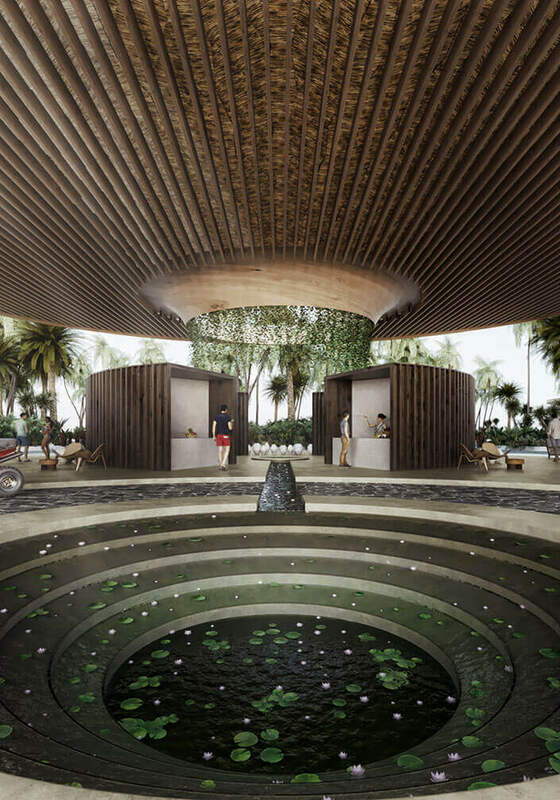 The master plan presents a scheme of 23 modules providing a total of 38 luxury rooms. The range of rooms includes 30 suites with one bedroom, 8 suites with two bedrooms, 2 villas with 3 rooms and 2 villas with 5 rooms. A spa, various restaurants, retail and sporting areas together comprise the hotel’s program of amenities. 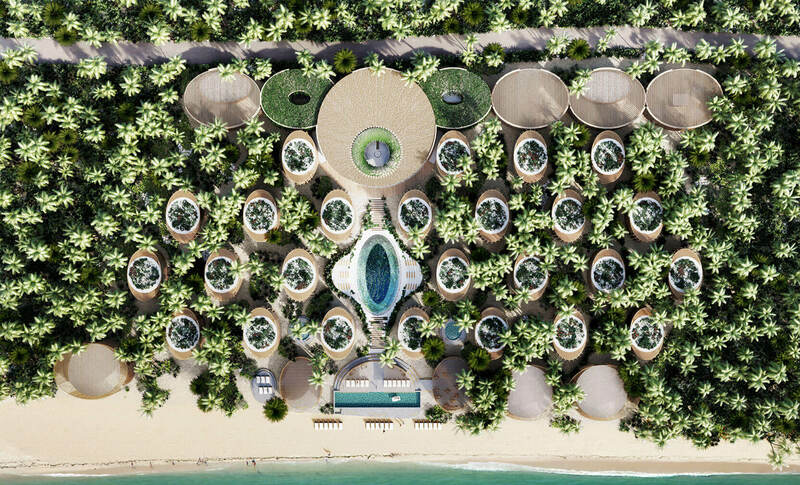 In order to ensure proper control of the site’s climatic conditions, as well as to achieve the greatest possible efficiency, passive and ecological systems were designed, such as green roofs for each module to reduce solar gain and increase the comfort of guests. With the intention of blending in with its surroundings, the complex uses natural materials typical of the local architecture, such as wood, renders with warm hues, and colored concrete.